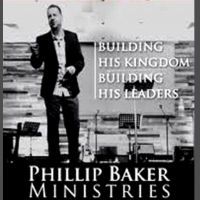 June 2003, Phillip and Laura birthed PBM – Phillip Baker Ministries. PBM is passionately dedicated to bringing a balance between the Move of The Holy Spirit, and The Love of God, along with Leadership Training to The Local Church. We believe that “The Anointing Builds the Kingdom and Leadership builds the Church”. Balance is the key to increase in these last days! Along with Leadership Seminars PBM conducts Marriage, Financial, and Altar Training Seminars through out the churches. Phillip’s itinerary allows him to be in over 50 churches a year as well as international trips as the doors open. We have been honored to preach the Gospel in America, Mexico, Belize, Brazil, Bulgaria, Israel, Tanzania, Australia, Vanuatu, Papua New Guinea, and the Solomon Islands!